If you look at the recently published robotic research done by researchers at Massachusetts Institute of Technology, the basic physical unit to construct a robot is small-sized electromechanical system integrated with electronics. Researchers at MIT have developed cube like blocks, which can assemble themselves into different shapes. The concept called modular robots is becoming realistic. The cube like blocks called M-Blocks have no external moving parts. They can climb over and around one another, leap through the air, roll across the ground, and even move while suspended upside down from metallic surfaces. See the picture below how a single block looks like. Each M-Block is a flywheel that can rotate at speeds of 20,000 revolutions per minute. The angular momentum to the cube is created by suddenly stopping the rotating flywheel. These M-Blocks attached to each other by using permanent magnets on the walls of the cube. Various techniques can be employed for the individual blocks to connect to each other. Self assembling robot technology such as this is going to be the best technology for robots to do humanlike physical activities. To achieve static stability, MIT researchers have used magnets in such a way that, they rotate so that North Pole of one magnet is aligned to south pole of the other magnet. Cylindrical shaped magnets are mounted like rolling pins on the corners of the cube. The bevel edge shaped cubes enables stronger connection between the cube. There are symmetrically arranged four more pairs of smaller magnets On each face of a cube to snap a moving cube into place when it lands on top of another. The real capabilities of this type of self assembled robot lies in the capabilities of the single unit. The smaller the single unit, it's better the performance of robot. Finally it's comes to a micro-sized electromechanical system integrated with on-block electronics for control and communication. That is precisely Micro Electro Mechanical System (MEMS) device. 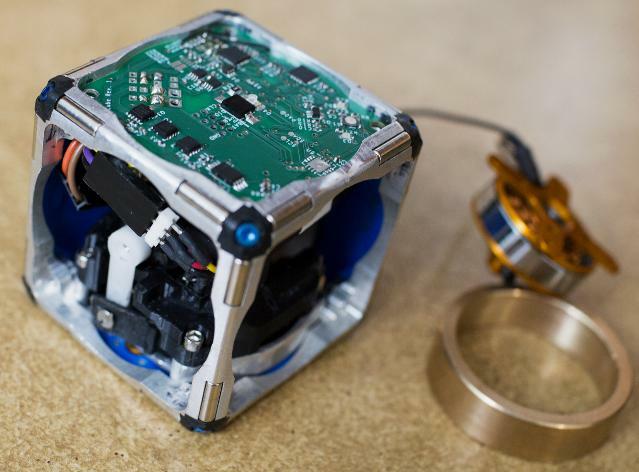 But today's MEMS devices are more of a sensors, if they can produce electromechanical energy, then they can be used like M-Block of MIT researchers' robot. MEMS becoming kind of microbots. As explained in the release from MIT "the ultimate aim of most such research is hordes of swarming microbots that can self-assemble, like the “liquid steel” androids in the movie “Terminator II.” And the simplicity of the cubes’ design makes miniaturization promising." To give you an Indian example, Rajnikant starred movie Robo has a scene where multiple robots assemble themselves to physically catch hold of a flying helicopter. The applications of self assembling robots are plenty. They can be used to build bridges, to repair bridges, to repair buildings, to raise and reconfigure scaffolding for building projects. With the option of high-flexibility, applications are as broader as you can imagine. With the present technology integrating micro- size electro mechanical systems with control electronics is very much possible, but the challenge is to make them withstand physical stress. And also another challenge is feeding them with the energy. Storage of energy is difficult due to size factor, the best option can be wireless charging of these devices, but the problem is efficiency. The energy efficiency is the biggest challenge in robotics. MIT researchers are building an army of 100 cubes, each of which can move in any direction, and designing algorithms to guide them. “We want hundreds of cubes, scattered randomly across the floor, to be able to identify each other, coalesce, and autonomously transform into a chair, or a ladder, or a desk, on demand,” Romanishin says.